The first crop of spring is being harvested here on our farm. The early rhubarb stalks are tender and juicy. 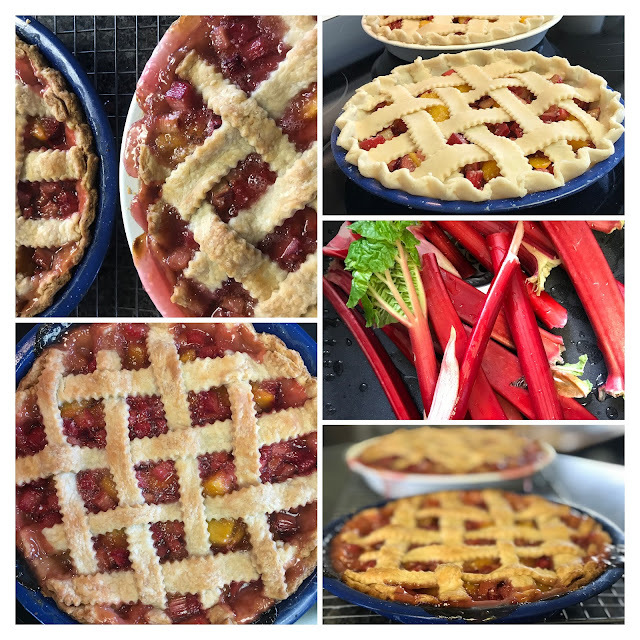 If you are as excited about rhubarb as I am, you will pick them before they are fully grown and pair them with frozen peaches from your freezer. It's a perfect pairing with the tart taste of rhubarb and the sweet goodness of peaches. I like to make a pie the perfect size for a dinner party and so when the table is set for six, I make a pie that is cut into six. I made enough filling for another small pie to share. If you want, you can use this filling in one large deep dish pie. Also, I like to use a lattice top crust when the filling is beautifully bright. It also helps to know exactly when the center of the filling is cooked. Mix all the ingredients together for filling. Set aside while you roll out the pastry. Roll out two discs to fit 9-inch pie plates, trim edges from both pies. Using all the trimmed pastry, roll out as thin and cut into strips to use for the lattice. Fill both pies with filling and arrange pastry strips evenly over both pies. Bake for about 45 minutes or until the crust is evenly brown and the center is clear and bubbly. Wonderful photos! Your recipe encourages me to go buy some rhubarb and have at it. I remember a neighbor giving us rhubarb, when I was a kid, and my mother making it into sauce or pies. Delicious either way. Here in Ontario snow still covers the ground but I can still make this wonderful pie with peaches and rhubarb from the freezer while I wait for Spring to arrive! I am delighted to say that I got to sample this beautiful dessert. The only problem was that I did not have the nerve to ask for a second piece. That tells you that this was a great combination.